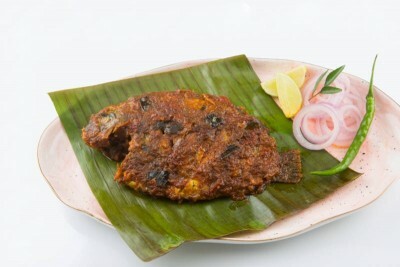 The fish is half cooked with a special masala and wrapped in a fresh banana leaf that adds its own flavour. This is then sealed in silver foil before it reaches you, ready to heat in a tawa and eat. Heat it very well on both sides. (Take your time, the fish and masalas inside the pack are cooking in its own steam). When done, place on a plate and unwrap carefully. Enjoy the rich, aromatic steam that is released as you open the foil and the leaf. Then heat & Eat, and eat, and eat.